We all have the problem when searching for our storage conatiners, finding a base and lid that fits and storing them takes up so much space! So lets introduce the unique stacking system of the Nest, all is solved! 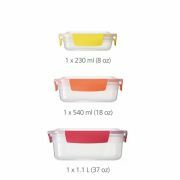 With the Joseph Joseph Nest set the container bases nest neatly inside each other and the lids clip conveniently together. As each element is colour-coded too, it's very easy to match lids with bases when you need them. These multi-size sets are ideal for storing a variety of leftover food in the fridge or freezer, without the risk of leaks. All Nest™ Lock containers feature lockable, airtight and leakproof lids and are dishwasher, microwave & freezer safe, as well as being BPA free. 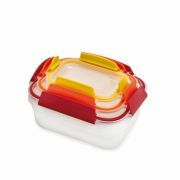 Care & Use: Before using in a microwave, remove lid and place loosely on top of container - do not close lid.